Cards on the table. I’m unashamedly biased in the following review. I love Roman epics and devour anything smelling even vaguely of sandals and red robes. I’m equally invested in Keith Nixon’s steamrolling writing career, which has been mainly focused on humorous, punchy, smart crime novels to date. Keith’s attention to detail, laborious research and flowing narrative makes the follow-up to Eagle’s Shadow a triumphant return to the world he’s fleshing out in the most subtle, but immersing manner. Writing a sequel comes with its own difficulties. Will the readers like where I take the story? Am I staying true to the characters but allowing their development? Is it as good as the first. Yes. Absolutely. No, it’s much, much better. 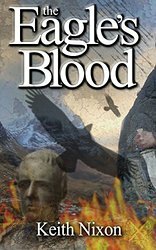 In Eagle’s Blood, Keith stretches his literary legs and pushes his skills to new levels. Danger, intrigue, betrayal, Romans, brother-hood and battles. All are presented with the confidence of a writer who has found a new voice in Historical fiction, one that both compliments and surpasses his enviable skills in his more familiar crime/thriller genre. At times one would swear that Nixon has a window to the past. Striding genre isn’t an easy skill for a writer to develop, few manage it effectively; even fewer make it appear effortless. Nixon’s return to Caradoc’s world screams of confidence and a refusal to be constrained by one writing style. Eagle’s Blood is available now from Gladius Press.